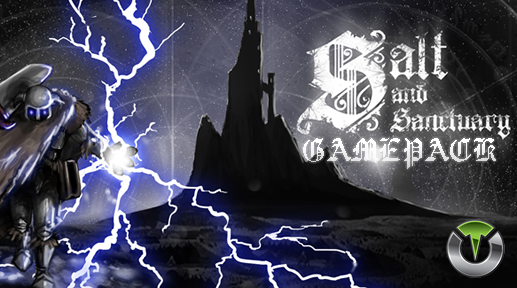 Titan One Exclusive Feature: Salt and Sanctuary Gamepack. Add combo sequence to the fast attack action. A single tap on fast attack button will perform its original action. Hold down the button performs the combo sequence chosen. Hold down the USE_ITEM and the fast attack button to charge the attack. Add combo sequence to the strong attack action. A single tap on strong attack button will perform its original action. Hold down the button performs the combo sequence chosen. Hold down the USE_ITEM and the strong attack button to charge the attack. Hold down the INTERACTION button to quickly pick items on the ground. Quick perform the parry action by just pressing the DPad UP button. Enable super jump action (across 2/3 of the screen) on R3 button. (1) The Dark Souls button layout reassigns the attack buttons to R1 and R2. (2) The God of War button layout reassigns R2 to Quick Parry, R1 to Block and UP to Loadout. Select any salt consumable, enter on the Inventory Menu -> Menu and select the "End Game" option. Press the Dualshock 4 touch button to start the dump combo according to chosen option.